Pembroke Gardens Bowling Club website. Getting ready for the new 2019 Season.... nearly there!! Here we are in mid-April with the league season starting straight after Easter. The Easter sunshine has helped dry out the bowling surface just at the right time. We will have three men's and one women's teams in action in a season running from April to September. 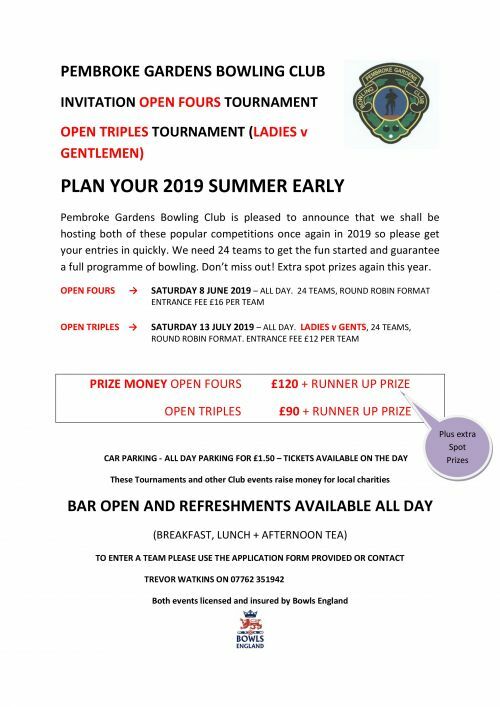 We are looking forward to hosting half a dozen friendlies, playing against visiting and touring teams and Pembroke Gardens will be running our two Open Tournaments in 2019 - the Open Fours in June and the Open Triples in July. Information and entry forms are already out and available from the website. There are two links you can click on to download more information and an entry form. So come and join us! If you just want to turn up and bowl in a relaxed, informal style we have roll-ups every day. If you have not tried the game of bowls yet and want to have a go we are holding two"Come and Try" sessions on 27 April and 4 May. We can provide a set of bowls and some basic tuition. We just ask you to wear flat shoes to help protect the bowling surface. We also have a few social events planned including a trip to Goodwood Races, our own in-house horse racing fun evening and a Quiz Night. We must be one of the busiest clubs in Portsmouth. All games and events are displayed under the Events Tab above. If you are a touring team looking for a fixture on the South Coast just look at what Pembroke Gardens BC can offer. Six rinks (seven at a squeeze), a spacious clubhouse with ample room to seat over 50 people, a small but well-stocked bar and a warm welcome. Just click once on the About Us Tab above to see a map. There are lots of hotels to choose from, other bowling clubs in and around Portsmouth and there is plenty for the non-bowlers to do. The Portsmouth Historic Dockyard with the new Mary Rose museum, HMS Victory and the Submarine museum are just a few minutes away. Boat trips around the harbour, the Spinnaker Tower, Gunwharf Quays for shopping or even a trip to the Isle of Wight, are all waiting for you to come and enjoy. So get in touch and we will look forward to welcoming you to our green.